A bright, cheery basket filled with colorful flowers, plants and a little bird, too. Its just what the doctor ordered. 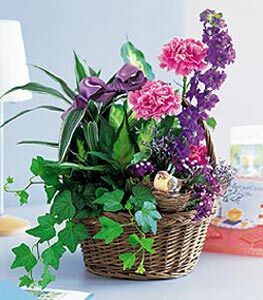 Fresh carnations and larkspur combined with dieffenbachia and ivy plants are delivered in a wicker basket, along with a little bird in a nest. Nest & bird not available in all areas.